Inter-Tel offers voice and data communications solutions for customers of all sizes, whether you are a large enterprise, small to medium business, or have residential home-based business needs. Inter-Tel’s diverse product line includes converged (IP PBX) platforms and IP-enabled systems. Scalable deployment and migration opportunities enable our customers to grow and adapt their communications portfolio as their business needs change. Additionally, Inter-Tel’s belief in open, non-proprietary standards, such as Session Initiation Protocol (SIP), IEEE wireless and ITU voice standards, and more, helps protect your communications investments as technology changes. Most importantly, Inter-Tel recognizes that the true value in business communications is software applications that improve business processes and connect all the departments and resources of your organization into a single, cohesive unit. Inter-Tel’s Managed Services program is a comprehensive program of services designed to address the total cost of communications ownership—merging communications technology requirements into your unique business model. 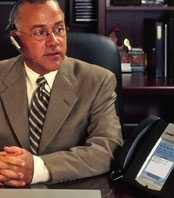 As a single-point-of-contact provider, Inter-Tel offers businesses end-to-end communications services and solutions including equipment, applications, carrier services, planning and provisioning, custom Interactive Voice Response (IVR) application development, and third-party peripheral products integration. Additionally, Inter-Tel’s National, Government and Education Accounts division is available to service and support large companies; Federal, state and local government agencies; and educational institutions. As a representative for Tier 1 regional and national telecommunications carriers, Inter-Tel offers a dynamic portfolio of products and services to meet your needs across all technical and geographic boundaries. Whether your need is for local or long distance voice services, Local Area Network/Wide Area Network (LAN/WAN) services, data transport and security solutions, or Internet connectivity and hosted solutions, Inter-Tel has all the necessary business components and enterprise procurement services in place to offer you complete technology solutions and implementations. Inter-Tel focuses on your business’s ability to add emerging technologies that respond to business needs—strategically connecting financial solutions and application objectives to deploy tangible, practical business solutions. Our diverse associates include technology implementation and integration specialists, manufacturer-authorized system engineers, network services professionals, and business support agents—ready to address your needs.